Pavla Houdkova, violin/viola... began playing the violin at age 6 and the viola at age 15. She studied for 5 years at the Conservatoire in Ceske Budejovice, Czech Republic and toured for 3 years with the South Bohemian Chamber Philharmonic Orchestra. She came to the United States in 1997 and began playing with Key West Strings in 1999. Pavla also gives private violin and viola lessons. Virginia Snodgrass, cello... began playing piano at age 7, and the cello at age 9. She studied & played cello throughout her college years, ( majoring in cello performance) in chamber ensembles and orchestras, including the Seattle Jr. Symphony, and gave private & group cello lessons for several years. Most recently she performed & toured for 18 years with the Whatcom Symphony Orchestra & Bellingham String Quartet in NW Washington. 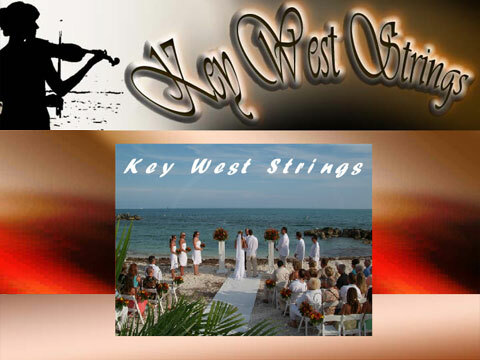 Upon moving to the Florida Keys in 2001, Virginia joined the Key West Pops, & plays cello with the Island Opera Co.& Keys Chorale as well as the Key West Chamber Orchestra. Melody Cooper... is originally from New York City. She began her studies of piano at age 7 and has continued ever since. Her informal training includes 2 years of university training and 30 years of personal lessons in piano and voice. She is currently studying advanced piano technique with Franko Richmond, a student of Earl Wilde. Ms Cooper is very active in the Key West musical community, and is a performing member of the The Paradise Big Band, Bach to Bossa Nova chamber ensemble, Keys Chorale, Island Opera Theater and performs regularly in nightclubs and at private functions..
Patricia Roman...began playing violin at age 9. Continued playing music throughout college, receiving a degree in Music Therapy from University of the Pacific in California. Performed for several years with the Stockton Symphony. Currently teach First Grade at Sugarloaf Elementary School. Moved to the Keys in 2000 and have enjoyed playing music with the Key West Pops, Island Opera Theater, Keys Chamber Orchestra and Keys Chorale.